Detailed description of each component listed below. Direct drive motor (using silver coils) using extreme quality parts (caps and resistors). One silver wire transformer is being used in the feed back loop. Two chassis construction: one inner chassis for motor – platter, one outer “Meteor” chassis with no cylindrical or flat surfaces in order to avoid any standing waves. It protects the motor platter assembly and is a very neutral and independent stand for the arm. Totally new axe- shaft assembly with ultra stable, though highly acoustically optimized platter (made of stabilized wood). 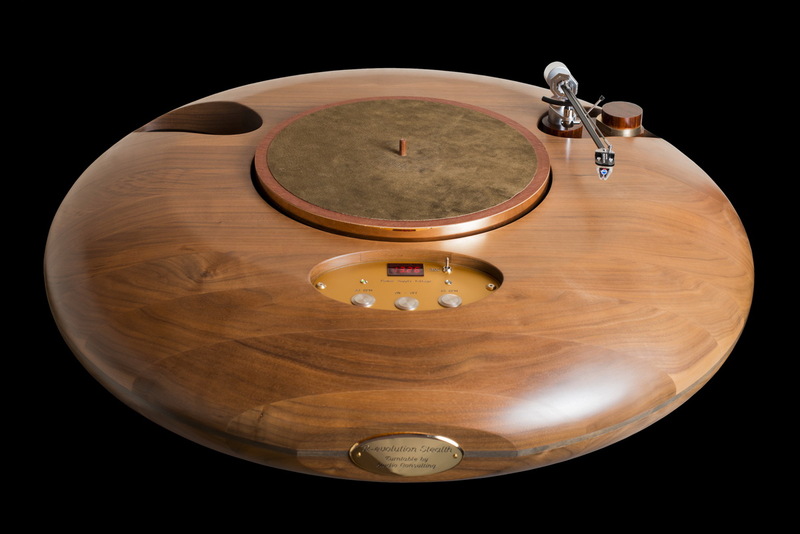 The platter is protected from air borne vibrations by the Meteor outer chassis. Battery power supply using the latest battery technology. Decoupling capacitors use values of several Farads, while being very fast at the same time. Active anti vibration system from Accurion. This cancels any low frequency below 200 Hz. 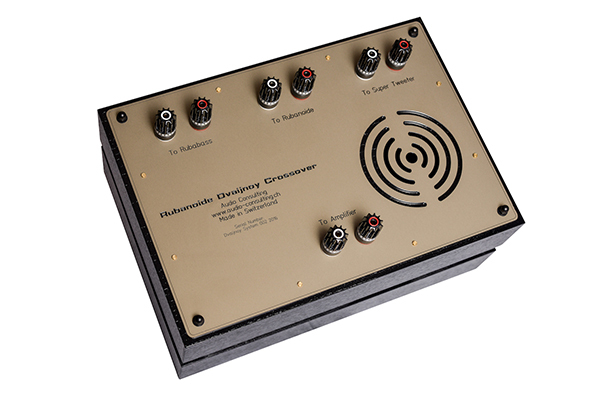 Unlike any air or spring system, this is still active at a few Hz, where passive devices face resonance. This alone allows for incredible silence between the notes. 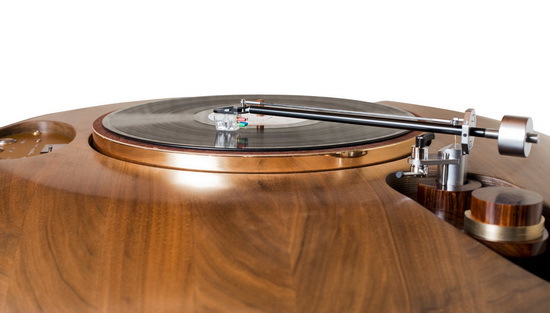 Two arms can be mounted to the turntable and can be used at the same time. 3. Meteor Mipa Stereo amplifier. We stick to the topology where the solid state technology finds its place between two transformers: input and output. 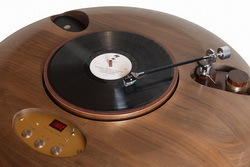 Thus, same as all Mipas, (and even SR Phonos) the Meteor Mipa features a transformer at its input and one at its output. They are of the latest toroidal technology using silver wire , silk and organic beeswax, all hand labour. Of course it is battery powered and due to a different semi conductor circuit, we were even able to use up to 1 ‘000’000 uF decoupling. The latter is an assembly of 50 smaller capacitors that are extremely fast. On the semi conductor side, we may mention , that thermal distortion has been further decreased,, same aseddy currents within the semi conductor. This leads to a very powerful , undistorted and higly resolved sound. 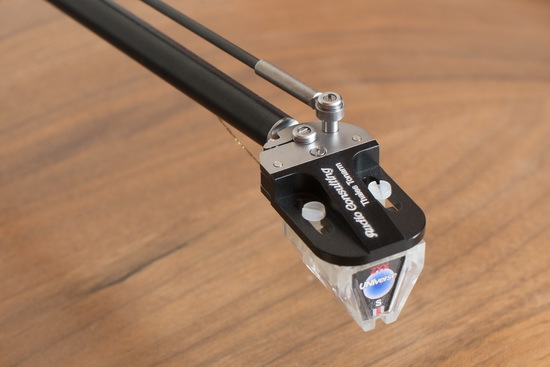 The new electronics in the Meteor Mipa is a class of its own. 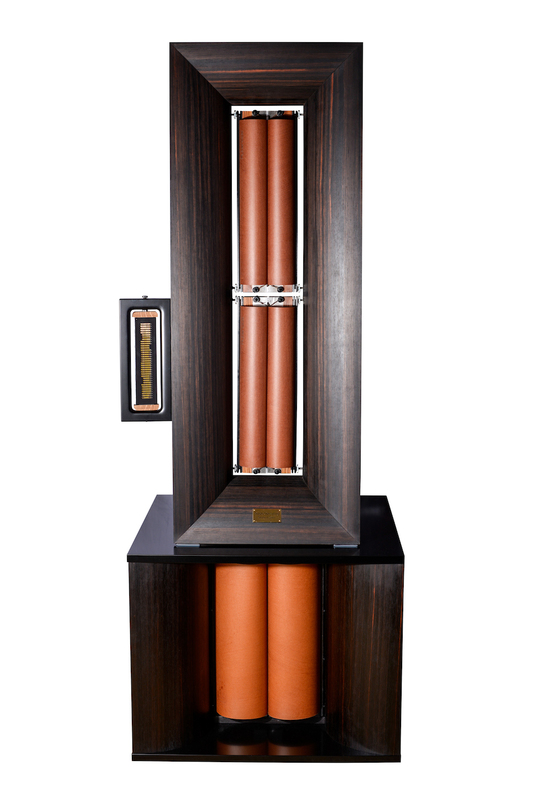 Last but not least, the Meteor cabinet, that is extremely effective in avoiding air born and internally born vibrations. This is due to the absence of flat and parallel surfaces. 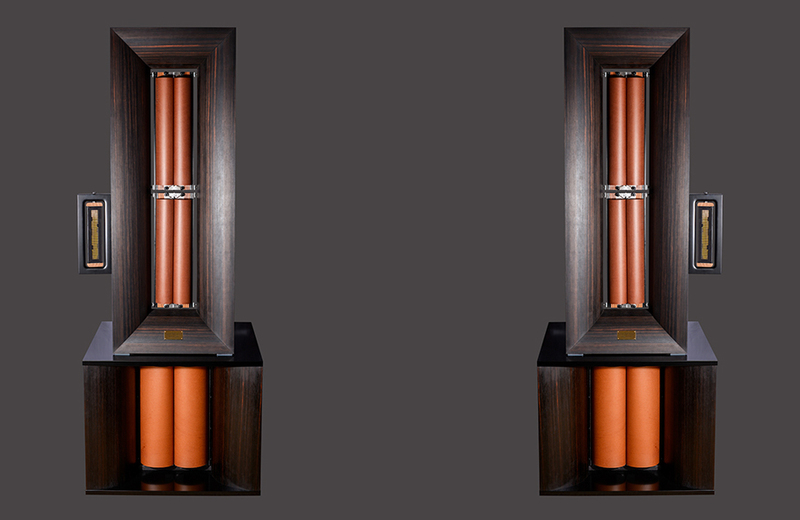 Each AVC is then carefully mounted into a cylindrically shaped wooden enclosure, and a pair of the latter is then mounted into the “Meteor” cabinet. The meteor cabinet that was first used for the MC Step up transformer is a very special design. It is CNC milled out of a single block of wood. 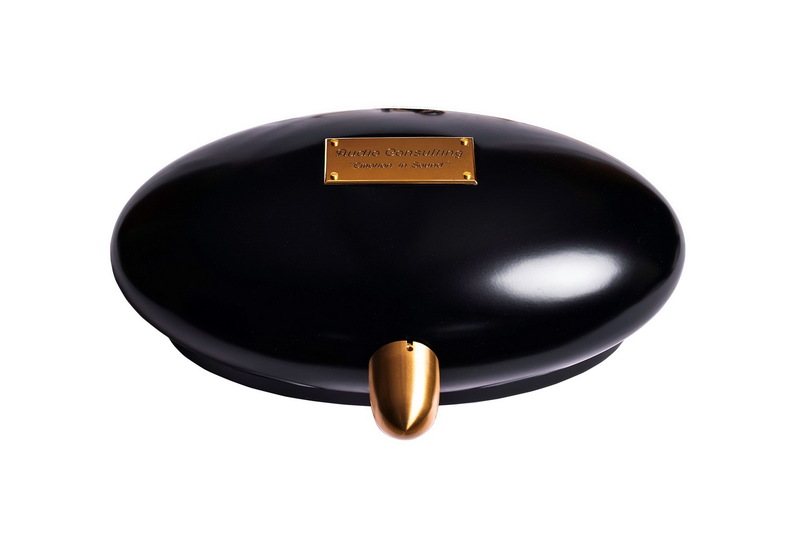 Not only its outer shape is of stealth technology, but also the inside shows not right angles. This allows for very low impact of sound waves to the outside of the cabinet, while waves travelling in the inside of the wood also find only a minimum number of flat surfaces. 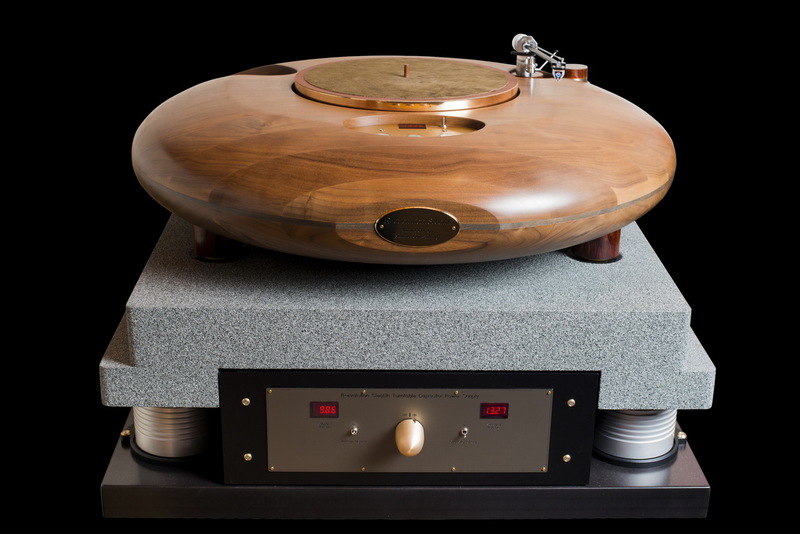 The combination of the “Meteor” cabinet and the new AVC is sonically very much superior to any magnetic volume setting device we have ever heard. The customer is happy with this very special item and we decided to add it to our list of products that are regularly available. 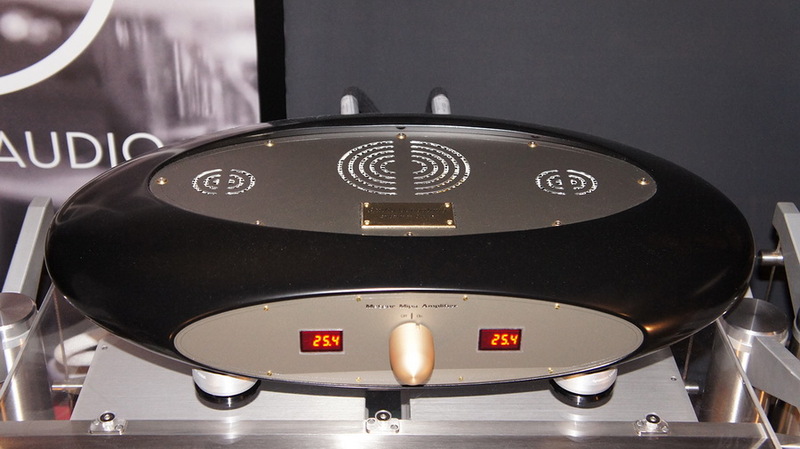 The Silver Rock Phono was made available in 2003. 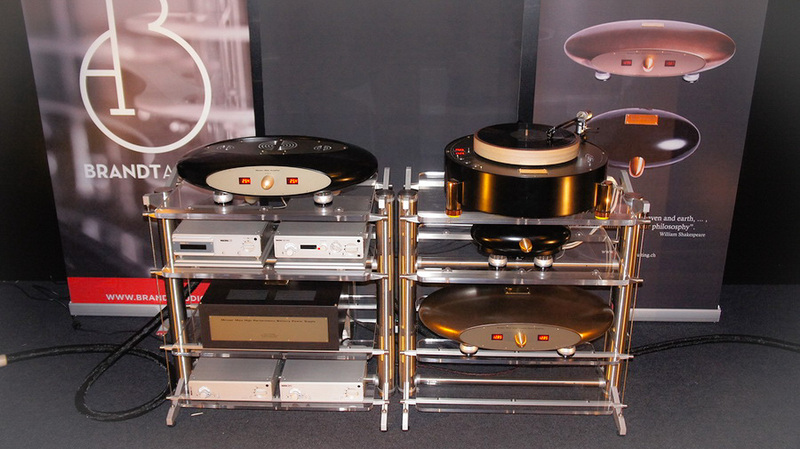 It has been a very successful Phono stage that the press and many of our customers have accepted with great enthusiasm. The basic topology was quite simple, while the complexity was included in the 4 inductive elements per channel. MC step up at the beginning, followed by an active device including inductive RIAA crossover, and finally an output transformer, which together reached a comfortable 70 dB of gain @ 1KHz. Over the last 5 years we have developed several products containing new toroidal core transformers (MC step up, Meteor AVC, Mipa Reference). 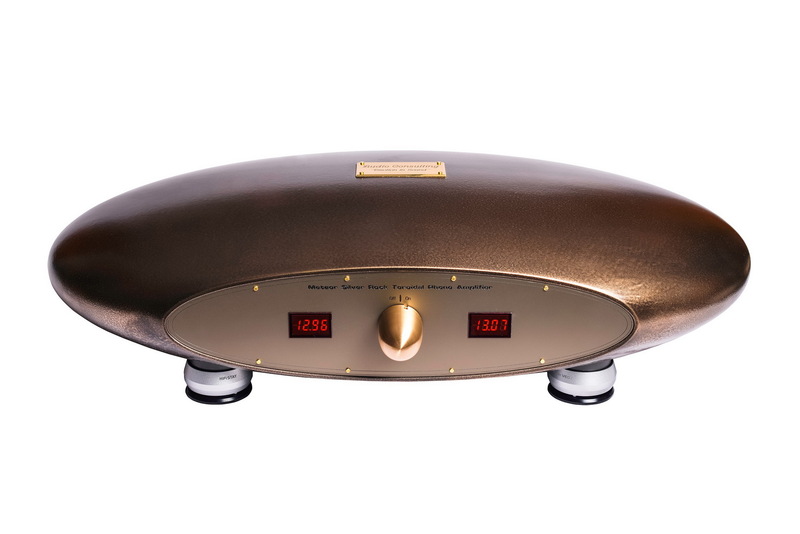 We gained knowledge in this specific field and decided to improve the already excellent Silver Rock Phono Amplifier, replacing all 4 inductive elements with toroidal cores. The power supply capacitors as well as the resistive elements were also improved while working on this “no compromise” Silver Rock Phono Amplifier. Further research in the field of airborne and ground transmitted vibrations lead to a “Meteor” version, which was presented to the public in May 2015. 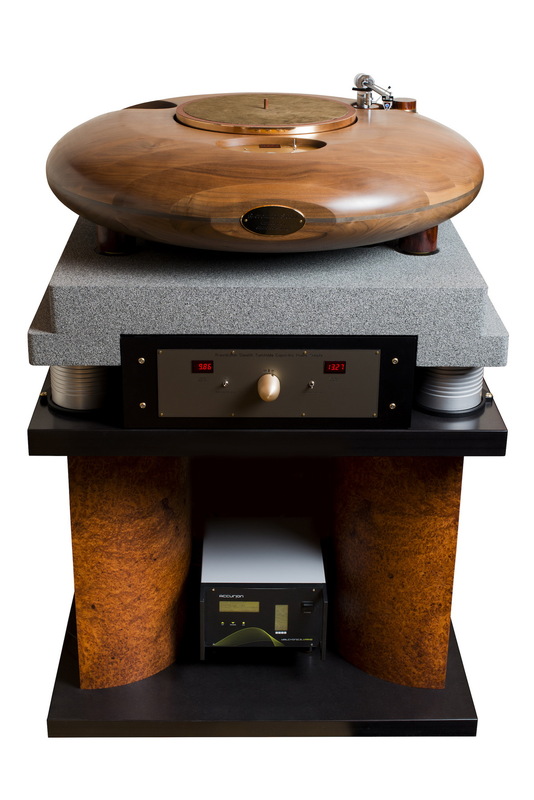 An oval cabinet that is milled out of a piece of wood the same way we produce our AVC “Meteor” cabinets was the beginning of this new version of the Silver Rock Toroidal Phono Amplifier. 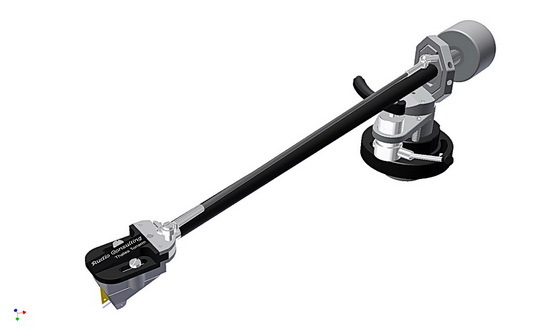 This avoids standing waves and contributes to a substantial improvement in noise reduction. In order to fight ground-transmitted vibrations, we decided to use the brand new Gyrotension VEGA Vibration Isolation Devices by Nasotec. They are built into the Meteor cabinet. Further vibration control for the 8 magnetic elements (silver wire transformers and inductors) are also being used in the form of natural damping materials. This technology totally excludes the use of any type of toroidal coiling machine. Thus all magnetic elements are hand coiled.